Much has been written about US and Vietnam relations since the last helicopter lifted remaining American personnel from the rooftop of the US Saigon Embassy during the 1975 final evacuation, as the final curtain closed on the tragic Vietnam War. Once enemies, Washington and Hanoi are now deeply invested in friendship, mutual respect and peace, working to ensure stability and to uphold freedom of navigation and sustained commerce in the South China Sea. Vietnam, along with other claimant nations, realize that they can no longer take on China’s advance alone. Beijing’s ambitious naval expansion, militarization of reclamations, and mega-trawler fishing operations challenge Hanoi and other regional nations in the South China Sea. Oil and gas resources, the depletion of species biodiversity, collapsing fish stocks, and overall security—all contribute to the growing importance of the SCS region. Concerns over China’s intentions to control SCS shipping lanes, along with the creation of its military bases on seven remote Spratly Islands reefs (Cuarteron, Fiery Cross, Gaven, Hughes, Johnson, Mischief and Subi) are alarming both regional stakeholders and Washington. Overall, China’s land reclamation has roughly tripled the size of the entire group of natural islands. While other claimant nations have reclaimed land as well, the total by China over the past several years is equivalent to 17 times of what others have done in the past 40 years. Vietnam knows all too well the conflicts associated with Chinese measures to occupy and claim disputed islands. January 19 marks the 45th anniversary of China seizing and and annexing the Paracel Islands, called the Xisha Islands by Beijing and the Hoang Sa Islands by Hanoi. In 1974, as US troops withdrew from Vietnam, China sent troops to the remote islands and more than 70 Vietnamese soldiers died in the resulting invasion. The two countries remain locked in a diplomatic struggle over a panoply of international law and conventions in their respective sovereignty claims. In Ly Son Island, scores of Vietnamese fishermen commemorate the deaths of those Vietnamese who bravely defended their archipelagos against the Chinese attack. Today, China, along with Taiwan and Vietnam, still legally claim the Paracels. For now, Vietnam should welcome Washington and the Trump administration to expand the US freedom of navigation operational patrols in the South China Sea since they contribute to peace and security. The presence of US Navy warships streaming through one of the world’s critical merchant gateways bolsters confidence that the United States has not ceded the South China Sea to China. Hanoi reveals a new geopolitical chart as they continue to navigate a closer and more comprehensive partnership with the United States. Their charm offensive was witnessed over the past several years with White House visits by Vietnam’s former President Truong Tan Sang, Prime Minister Nguyen Tan Dung, and Communist Party head Nguyen Phu Trong. Two years ago, the Vietnamese Prime Minister Nguyen Xuan Phuc was the first Southeast Asian head of state, and the third from Asia (after Japanese Minister Shinzo Abe and Chinese President Xi Jinping) to visit President Trump after he took office. The cooperative ties between the U.S. and Vietnam date back to 1994, when President Clinton lifted the trade embargo against Vietnam and, soon after the normalization of diplomatic relations in 1995, the two governments signed the Bilateral Trade Agreement. This has since paved the commercial road for the steady and substantial growth of trade between the two economies, with an increasingly favorable balance of trade for Vietnam. By 2006, the US Congress accorded Vietnam permanent normal trade relations status, which represented the completion of full normalization of economic ties and allowed Vietnam to join the World Trade Organization(WTO) in 2007 as its 150th member. While the Trump administration’s protectionist roadmap offers Hanoi some trade impediments, including the discriminatory anti-dumping treatment, policy experts remain bullish and optimistic about Vietnam’s progressive strides toward transforming into a market economy. Economists are quick to acknowledge that globalization has ushered in increased foreign investment in manufacturing plants like Nike in Vietnam, which employees over 400,000 young women. The tide of foreign direct investment pouring into the country has yielded many dividends including a dramatic decline in Vietnam’s poverty, improved living standards and increased life expectancy. Hanoi’s cautious and sequential adoption of market institutions have yielded two decades of impressive economic performance. “Nike and Coca-Cola triumphed where American bombs failed. They made Vietnam capitalist,” claims Johan Norberg, a senior fellow at the Cato Institute in Washington. Renewed Vietnam-US military cooperation is best symbolized by the nuclear-powered aircraft carrier USS Carl Vinson’s arrival in Da Nang last year, marking the first time such a ship has docked in the country since the Vietnam War. The Nimitz-class supercarrier with its 6,000 crew members, anchored off the coast of Da Nang and marked the largest US military presence in Vietnam since the war ended in 1975. This display of military cooperation and reception was also highlighted in 2016, when former President Obama lifted a decades-old ban on the sale of military equipment to Vietnam. The US-Vietnam defense relationship has included regular Naval Engagement Activities (NEA) over the past decade primarily to curb China’s assertiveness in the contested South China Sea. Furthermore, in 2017, the U.S. also transferred the decommissioned Coast Guard cutter Morgenthau to Vietnam’s Coast Guard, and signed a three-year plan for defense cooperation. In addition, the US Pacific Partnership has made regular humanitarian relief exercises with its fast transport ships to the coastal city of Nha Trang to provide humanitarian and disaster relief. Vietnam’s leadership does believe that both a symbolic and cooperative defense relationship with the U.S. promotes regional and global peace and security. Finally, the U.S. should consider the benefits associated with the US Congress ratification of U.N. Convention on the Law of the Sea (UNCLOS). It was adopted in 1982 and one hundred and sixty-two countries, including China and Russia, are signatories to the treaty that governs the world’s oceans. The U.S. has yet to adopt it. While the US Navy’s Seventh Fleet continues to reinforce freedom in the South China Sea’s disputed waters, the treaty formally defines the limits of a country’s territorial sea, establishing clear rules for transit through “international straits,” and “exclusive economic zones (EEZs).” In short, it would allow the US military complete freedom of action. With ratification, the United States would have legal standing to bring any complaints to an international dispute resolution body and thus avoid possible confrontation with Chinese naval forces and paramilitary fishing trawlers in the Spratly Islands. Furthermore, the treaty allows for formal cooperation with other countries, because almost all of Washington’s allies, neighbors, and friends are party to the Convention. The geopolitical message is simple: America requires maximum freedom both for naval and commercial vessels to navigate and to operate off foreign coasts without interference. Vietnam and other South China Sea claimant nations urge the U.S. to abide by UNCLOS’s provisions and for the US Congress to ratify it. At this moment, it’s possible that China is merely banking on the US government’s political impotence – now on display in the shutdown – to translate into its regional ambitions going unchallenged. The opinions, beliefs, and viewpoints expressed by the authors are theirs alone and don’t reflect the official position of Geopoliticalmonitor.com or any other institution. This article is originally published at Geopolitical Monitor. TAIPEI, TAIWAN — Vietnam’s tough stance against China over sovereignty of the South China Sea will put Beijing on the defensive during regional talks on easing the regional maritime dispute, people who follow the process say. FILE – People take part in an anti-China protest to mark the 43rd anniversary of the China’s occupation of the Paracel Islands in the South China Sea in Hanoi, Vietnam, Jan. 19, 2017. Officials in Hanoi have suggested establishing a code of conduct that, among other things, would bar construction on artificial islands in the South China Sea and ban militarizing disputed features, said Carl Thayer, a University of New South Wales emeritus professor, in an online commentary about a preview of a draft code text written last year. Vietnam, he added, wants to ban any blockades of vessels and nix the possibility of any single country’s air defense identification zone. Vietnam also would deem “unacceptable” any agreement excluding the sea’s Paracel Islands, which it claims but China effectively controls, according to a report posted by Gregory Poling, director of the Asia Maritime Transparency Initiative think tank project in the United States. FILE – Chinese dredging vessels are purportedly seen in the waters around Fiery Cross Reef in the disputed Spratly Islands in the South China Sea in this still image from video taken by a P-8A Poseidon surveillance aircraft provided by the United States Navy. Analysts say China has landfilled and militarized more of the 3.5-million-square-kilometer sea than any of the other five claimants. It will oppose the Vietnamese agenda, further setting back the 23-year-old code of conduct process but keep it at the bargaining table to show it’s a good neighbor, they expect. “Chinese hegemony of the South China Sea is not accepted by any of the states within the region,” said Stephen Nagy, senior associate politics and international studies professor at International Christian University in Tokyo. ASEAN leaders and delegates pose for a photo during a working lunch on the sidelines of the 33rd ASEAN summit in Singapore, Nov. 14, 2018. After 23 years of on-again, off-again efforts, the 10-member Association of Southeast Asian Nations (ASEAN) and China decided in 2017 to restart talks on a code of conduct aimed at preventing accidents while leaving sovereignty issues aside. China has said a final code should be signed by 2021. Four association countries and Taiwan dispute China’s claims to about 90 percent of the sea. China and Vietnam have gotten into three clashes there since the 1970s. Vietnam’s suggestions for the code, if they carry forward, would affect China the most because of its reach over the sea valued for fisheries, shipping lanes and energy reserves. China has reclaimed about 1,200 hectares of land to build out tiny islets and placed military hardware such as aircraft on some, maritime scholars believe. The wording from Hanoi would spotlight China’s expansion at sea, a trend Beijing seldom publicizes. It might also serve as a bargaining chip during later stages of talks about the code of conduct, they say. “Vietnam is in a difficult position as perhaps the country that is pushing back most vociferously against the gradual expansion of Chinese control over the South China Sea,” said Denny Roy, senior fellow at Honolulu-based research organization the East-West Center. Hanoi lost control of the Paracel chain of some 130 islets to China in the 1970s. Brunei, Malaysia, the Philippines and Vietnam vie with China sovereignty in the Spratly Island chain. China would oppose Vietnam’s ideas for the code, experts say. Beijing is unlikely to show foreign policy “weakness” this year before celebrations of its 70th anniversary of Communist Party rule, said Alexander Huang, strategic studies professor at Tamkang University in Taiwan. China bases its maritime claims on fishing records it says date back some 2,000 years. But China will keep negotiating the code of conduct because it’s under “tremendous pressure” to reduce tensions in Southeast Asia so it can focus instead on ties with the United States, Nagy said. The U.S. government helps train troops in the Philippines and periodically passes ships through the sea to show it’s open to all. Despite historical jousting between China and Taiwan over territory, the two countries’ communist parties regularly discuss maritime issues. They have agreed the Paracel dispute should stay between them, said Termsak Chalermpalanupap, fellow with the ISEAS Yusof Ishak Institute in Singapore. Vietnam’s conditions for the code would delay code negotiations, he said. “I think it will be slow, because the Chinese side already said three years’ time frame, so they will just go through the motions of having meetings,” Chalermpalanupap said. (MELBOURNE – Gareth Evans | Project Syndicate) – To no one’s surprise, the Permanent Court of Arbitration (PCA) in The Hague has upheld all the key arguments of the Philippines in its case against China on the application of theUnited Nations Convention on the Law of the Sea (UNCLOS) in the South China Sea. In its ruling, which employed even tougher language than most expected, the tribunal cut the legal heart out of China’s claim that the sea is, in effect, a Chinese lake. The PCA’s decision punctures any notion that international law now recognizes “traditional” or “historic” maritime claims not directly associated with recognized sovereign ownership of relevant types of land. Recognized ownership of a habitable island, as with mainland territory, includes a 12-nautical-mile territorial sea, a 200-nautical-mile exclusive economic zone or EEZ and rights over any associated continental shelf (subject to any overlapping rights of others). Recognized ownership of an uninhabitable rock or permanently protruding reef includes the surrounding 12-nautical-mile territorial sea. Nothing more. Without land, a state cannot claim rights to the sea. China can and will continue to claim that, despite competing claims by Vietnam, the Philippines, and others to the land features in question, it is the sovereign owner of habitable islands and permanently protruding rocks or reefs in the Spratly and Paracel Island groups and elsewhere. In making its case, it can invoke accepted legal criteria like effective occupation or acquiescence. When added to its own coastal entitlements, China might well end up with a sizeable and entirely defensible set of rights in the South China Sea. But the PCA addressed none of these underlying sovereignty issues in the Philippines case. And, crucially, even if all of China’s sovereignty claims in the South China Sea were one day accepted – whether through negotiation, arbitration, or adjudication – the total area, including territorial sea, EEZs, and continental-shelf rights, would still not approach the size of the vast zone encompassed by the nine-dash line. The PCA’s decision also rules out China’s claim to an unlimited right to pursue and stare down any close surveillance of its massive reclamation activity and construction of military-grade airstrips, supply platforms, communications facilities, and in some cases gun emplacements. Such construction has occurred on seven previously unoccupied locations in the Spratlys: Mischief Reef, Subi Reef, Gaven Reef, and Hughes Reef (all previously submerged at high tide), and Johnson South Reef, Cuarteron Reef, and Fiery Cross Reef (all previously part-exposed at high tide, but uninhabitable). Under UNCLOS, states may construct artificial islands and installations within their own EEZs, and also on the high seas (but only for peaceful purposes). In neither case can this have the legal effect of turning a previously submerged reef into a “rock” (which might allow a 12-mile territorial sea to be claimed), or an uninhabitable rock into an “island” (which might allow for a 200-mile EEZ as well). The Philippines case confirmed these basic principles. In doing so, the PCA also made clear that China had no right whatsoever – at least in the case of the previously submerged Mischief Reef – to engage in any construction activity, as the territory it claims is within the Philippines’ EEZ. China seems unlikely to abandon occupancy of any island, reef, or rock where it currently has a toehold, or to stop insisting on its sovereign ownership of most of the South China Sea’s land features. But everyone with an interest in ensuring regional stability should encourage China to take several steps that would not cause it to lose face. These steps include a halt to overtly military construction on its seven new artificial islands in the Spratlys; not starting any new reclamation activity on contested features like the Scarborough Shoal; ceasing to refer to the “nine-dash line” as anything other than a rough guide to the land features over which it continues to claim sovereignty; submitting these claims at least to genuine give-and-take negotiation, and preferably to arbitration or adjudication; advancing negotiations with ASEAN on a code of conduct for all parties in the South China Sea; and an end to dividing and destabilizing ASEAN by putting pressure on its weakest links, Cambodia and Laos, on this issue. The alternative course, already being promoted by hotheads in the People’s Liberation Army, is to take a dramatically harder line by, say, renouncing UNCLOS altogether and declaring an Air Defense Identification Zone (ADIZ) over most of the South China Sea. Declaring an ADIZ, which the United States would certainly ignore, would sharply increase the likelihood of military incidents, with wholly unforeseeable consequences. Walking away from UNCLOS would also be wrongheaded. China would still be effectively bound by its terms, now almost universally recognized as customary international law, irrespective of who adheres to it. The gesture of defiance would damage both its reputation and other territorial interests, not least its claims against Japan in the East China Sea, which rely on UNCLOS’s continental-shelf provisions. If China takes a hardline path, or fails to moderate its behavior significantly in the months ahead, the case for further international pushback by countries like mine – including freedom-of-navigation voyages within 12 nautical miles of Mischief Reef and other artificial islands in that category – will become compelling. But right now it is in everyone’s interest to give China some space to adjust course and to reduce, rather than escalate, regional tensions. This article is originally published on Project Syndicate. by Tuong Nguyen | Eurasia Review – For the second time since the Johnson South Reef – Gac Ma skirmish twenty-five years ago, the largest daily newspapers in Vietnam have written special columns commemorating sixty-four martyrs sacrificed to defend their homeland’s sovereignty at the Spratly Islands in the South China Sea. Vietnam and China have been known as neighbors and brothers like “lips and teeth”. However, bearing the same pressure as other China’s “unhappy neighbors”, Vietnam had to fight against its big brother China to protect its sovereignty. The skirmish on March 14th, 1988 at Johnson South Reef – Gac Ma (Spratly Islands) is a recent Sino-Vietnamese naval confrontation. The site lies at 4 nautical miles (nm) to the northwest of Vietnamese-controlled Collins Reef. Chinese gunboats sank and damaged three Vietnamese vessels. Sixty-four Vietnamese soldiers were killed and many others injured, while one Chinese was wounded. Despite many conflicts in the past, Hanoi and Peking always maintain their “16 golden words and four cardinal principles” for example regarding the bilateral consensus to actively guide public opinion on the South China Sea disputes, a ‘sensible’ subject to Vietnamese government-controlled media (aka. “right side” media, in comparison to the free “left side” one) for long time. But the anti-China sentiment in public has been on the rise since the cable-seized incident of Vietnamese ships on May 2011. In the past two recent years, there have been remarkable improvements of media in Vietnam on the South China Sea issues, especially with the development of new media with blogs, forum or the social networks where everyone may express and share easily their opinions to the world. However, the Johnson South Reef skirmish is a poorly titled subject in Vietnamese “right side” media. On May 7th, 2012, the Vietnamese government organized for the first time a commemoration day for sixty-four martyrs sacrificed in navel battle at Johnson South Reef. This year, Tuoi Tre, one of largest “right wing” newspapers, focuses on the topic with a series of touching stories about killed soldiers, live witness and remains of the battle that create actually a tacit movement that heats up the anti-China sentiment in the Vietnamese communities and social networks. It’s also important to mention that the Sino-Vietnamese naval battle on January 19th, 1974 at Paracels Islands was officially commemorated for the first time last January 19th 2013 by Thanh Nien News, another government-controlled daily newspaper. Both Vietnam and China have declared the historical sovereignty in the South China Sea (including Spratly Islands and Paracels Islands) where five other countries (Brunei, Indonesia, Malaysia, Philippines, Taiwan) also claimed their territory or territory rights. Tuong Nguyen is a computer science postdoctoral fellow in France and free commentator on maritime affairs. Bill Hayton says records show that a translation error some 80 years ago may be to blame. – by Bill Hayton | The South China Morning Post – Where is the “southernmost point of Chinese territory”? It’s a controversial question and the least controversial answer might be Hainan Island . More controversial options would be the Paracel (Xisha) islands or the Spratlys (Nansha). But officially the southernmost point is even further south – as far south as the James Shoal, about 100 kilometres from the coast of Borneo. What’s more surprising is that this piece of the motherland is actually invisible. There’s nothing there to see, unless you have diving equipment. The James Shoal lies 22 metres below sea. Yet this inconvenience doesn’t prevent PLA Navy ships visiting the shoal from time to time to demonstrate Chinese sovereignty over it. This ritual involves heaving a large piece of engraved stone over the side of the ship. There is now a small collection of Chinese stelae gathering organic encrustations on the sea floor, more than 1,000 kilometres from Hainan. How did the Chinese state come to regard this obscure feature, so far from home, as its southernmost point? I’ve been researching the question for some time while writing a book on the South China Sea. The most likely answer seems to be that it was probably the result of a translation error. In the 1930s, China was engulfed in waves of nationalist anxiety. The predation of the Western powers and imperial Japan, and the inability of the Republic of China to do anything meaningful to stop them, caused anger both in the streets and the corridors of power. In 1933, the republic created the “Inspection Committee for Land and Water Maps” to formally list, describe and map every part of Chinese territory. It was an attempt to assert sovereignty over the republic’s vast territory. The major problem facing the committee, at least in the South China Sea, was that it had no means of actually surveying any of the features it wanted to claim. Instead, the committee simply copied the existing British charts and changed the names of the islands to make them sound Chinese. We know they did this because the committee’s map included about 20 mistakes that appeared on the British map – features that in later, better surveys were found not to actually exist. The committee gave some of the Spratly islands Chinese names. North Danger Reef became Beixian (the Chinese translation of “north danger”), Antelope Reef became Lingyang (the Chinese word for antelope). Other names were just transliterated so, for example, Spratly Island became Sipulateli and James Shoal became Zengmu. And this seems to be where the mistakes crept in. But how to translate “shoal”? It’s a nautical word meaning an area of shallow sea where waves “shoal” up. Sailors would see a strange area of choppy water in the middle of the ocean and know the area was shallow and therefore dangerous. James Shoal is one of many similar features in the Spratlys. But the committee didn’t seem to understand this obscure English term because they translated “shoal” as ” tan” – the Chinese word for beach or sandbank – a feature which is usually above water. The committee, never having visited the area, seems to have declared James Shoal/Zengmu Tan to be a piece of land and therefore a piece of China. In 1947, the republic’s cartographers revisited the question of China’s ocean frontier, drawing up what would become known as the “;U-shaped line&#8221;. It seems that they looked at the list of Chinese names, assumed that Zengmu Tan was above water and included it within the line. A non-existent island became the country’s southernmost territory. But in a parallel process around the same time, the republic government gave new names to many of the sea features. Spratly Islands became Nanwei (the noble south), for example, and James Shoal was changed from a sandbank ( tan) into a reef ( ansha). Perhaps, by this time, the authorities had realised their mistake. Nonetheless Zengmu Ansha retained its official southernmost status. By now, the translation error had become a fact, setting the region on course for conflict 80 years later. This is more than a piece of historical trivia; James Shoal is a test of whether Beijing really is committed to the rule of international law in the South China Sea. Under the United Nations Convention on the Law of the Sea, no state can claim sovereignty over an underwater feature unless it lies within 12 nautical miles of its land. James Shoal is over 1,000 kilometres from undisputed Chinese territory. Last month, the Philippines government announced it would seek a ruling from an international tribunal about whether China’s claims in the sea were compatible with the UN convention. James Shoal would be a clear example of a claim that is not compatible. Perhaps this might be a good moment for Beijing to review how it came to claim this obscure piece of submarine territory in the first place. by Editorial Board | Thanh Nien News – Panelists at a recent conference on the East Sea held in Paris said China has no legal claim to sovereignty over large parts of the sea, and Vietnam and other countries involved should take it to an international court. Conflicts over the East Sea, also known as the South China Sea, should not be considered just a regional issue, Tuoi Tre quoted them as saying. Christian Lechervy, special advisor to the French President on foreign affairs, said the issue is not only about Truong Sa (Spratly) and Hoang Sa (Paracel) Islands that Vietnam and China are fighting over, but also includes the disputed Pratas Islands, Scarborough Shoal, and other islands and straits. The conference on October 16 was organized by the Institute for International and Strategic Relations and the Gabriel Péri Foundation. Conflicts over the waters have become more intense since 2009 when reserves of oil and gas, rare earths and other minerals, and seafood were found even as resources in most countries were running out. Cyrille P. Coutansais, a maritime law officer in the French Navy, said international laws and regulations should be enforced so that this area is not appropriated by force. Only international rules such as the 1982 Geneva Conventions on the Law of the Sea and the 1982 United Nations Convention on the Law of the Sea, the latter giving each country a 200-sea-mile economic zone, can resolve the matter fairly, he said. China has been acting like the waters are its own, but without basis in international law or treaties it has signed, the experts said. Patrice Jorland, a French journalist, said the name South China Sea, given by marine traders and European cartographers centuries ago, is no longer suitable in the current political situation since it make its sound like the waters belong to China. China has refused to accept this, and in 2009 presented to the UN a U-shaped line — including 80 percent of the waters and most islands — as demarcating Chinese territory. The UN’s International Hydrographic Organization decided that the U-shaped line is vague and technically inaccurate and thus cannot be admitted as legal evidence. But China showed little cooperation to clarify the matter, legal experts said at the conference. David Scott of Britain said China has refused to clarify how the line was created technically. Professor Monique Chemillier-Gendreau of France also recalled an experience in Beijing three years ago when high-ranking Chinese officials had said the waters were theirs and they had no responsibility to provide any evidence or go to any court, she said. It has documents about the waters since 1930, while Vietnam has some papers dating back to the 17th century, she said. The panelists said instead of going in for international arbitration, China is using bilateral dialogue as a secret weapon. China’s strategy is to financially exhaust each country involved in the dispute by forcing them to militarize, until they no longer care and would sign agreements in favor of China, they said. They encouraged Vietnam, the Philippines, and other countries caught in the dispute to deal with China multilaterally, bringing it to the Hague, warning otherwise they would lose everything. Coutansais said Vietnam and the Philippines do not have to get China’s agreement to find an international referee. If both of them take China to court, China would have to go, he said. by Mark J. Valencia | Global Asia – The latest act in the long-running saga of the South China Sea has seen China moving aggressively to enforce its claim to most of the features of the potentially oil-rich sea while the US ‘rebalanced’ its defense and foreign policy toward Asia. As a partial result of US-China rivalry, ASEAN’s unity and its centrality to security issues are facing a severe crisis. The drama is far from over, writes Mark J. Valencia, and the road to a satisfactory management of the South China Sea conflicts is fraught with peril. THERE HAVE BEEN numerous significant developments in the South China Sea disputes over the past year.1 At the end of 2011 there was in place a weak and leaking Declaration on Conduct (DoC) for activities in the sea as well as vague and general guidelines for its implementation. The bilateral/multilateral conundrum regarding the process of negotiations between China and ASEAN loomed large. The Philippines was mounting a campaign to get China to clarify its nine-dashed line claim (see map on page 60) and pushing a proposal for a Zone of Peace, Freedom, Friendship and Co-operation designed to separate “disputed” from “non-disputed” areas in the South China Sea. China had warned Vietnam, the Philippines and India (its national oil company ONGC was operating in the sea under license from Vietnam) against exploring for hydrocarbons within its claim line. Yet both ONGC and Forum Energy/Philex Petroleum had announced plans to drill in 2012 in areas claimed by China — the latter on Reed Bank. India had entered the mix not only via its national oil company but by insisting that it has a rightful naval interest in the South China Sea. Most significant, the US-China rivalry in the region was intensifying, sucking ASEAN and its members into its turbulent political wake. Indeed the disputes had become a new cockpit of China-US competition, distorting and overshadowing the intra-ASEAN and ASEAN-China disputes. The US-China rivalry was driving the issues forward and creating pressure on ASEAN and China to make progress or at least put together a temporary arrangement regarding the disputes. This paper covers developments from the November 2011 Bali summits through the July 2012 Phnom Penh ASEAN meetings and their immediate aftermath. It summarizes the current political and strategic context, significant developments and the current situation, and then sketches several alternative futures. The tectonic plates of the international political system are inexorably grinding against one another, and the US and China are on opposite sides of the divide — and perhaps history. The US is yesterday’s and today’s sole superpower, but its credibility, legitimacy and ability to enforce its will are fast eroding.2 China’s leaders believe China represents the future, not just in hard power but also in economy, culture and values. Indeed, China’s leaders believe it is China’s destiny to regain its prominence — if not pre-eminence — in the region and perhaps eventually the world. In classic realist theory, established powers strive to preserve the status quo that assures their position at the top of the hierarchy and view emerging powers as potential threats. Rising powers feel constrained by the status quo and naturally strive to stretch the sinews of the international system. They fear that the dominant power will try to snuff them out before they become an existential threat. These are the primordial political dynamics of the US-China struggle. Their rivalry is fast becoming a zero-sum game, and both are extremely suspicious of each other’s intentions. Indeed, both countries “see deep dangers and threatening motivations in the policies of the others.”3 It does not help that leadership transitions are under way in both countries, and no candidate for leadership in either country can afford to be seen as weak on such security issues. Some US analysts even see an incipient Chinese “Monroe Doctrine” that would attempt to push the US out of the region.4 Worse, the US and China are tacitly forcing Asian countries to choose between them. • Can ASEAN maintain unity by resolving its internal differences on these issues or is ASEAN unity in security a myth and an impossible dream in an era of competing big power strategic concepts and capabilities? • Will US-China rivalry dominate these and other ASEAN “Plus” forums? • Will the US attempt to drive the agenda of these forums and to emphasize negotiations and deliverables as opposed to ASEAN’s more laissez- faire approach? However, US reassurance of its allies and friends may have emboldened some to confront China. Further, US attempts to control regional institutions are likely to be perceived by some Southeast Asian countries as upsetting an already delicate geopolitical balance. For them, how the US behaves regarding the South China Sea disputes will say quite a bit about the future geopolitical environment. China basically believes that Southeast Asian claimants to various islands are nibbling away at its legacy and rightful ownership of islands and resources in the South China Sea and that they are colluding with the US against China. China clearly realizes that the US is not going to go away on its own nor reduce the pressure of its presence in the region. Indeed, contrary to China’s characterization of it as an “outside power,” the US says it is part of the Pacific family of nations and that it has a valid interest in freedom of navigation and access to the international commons in the South China Sea. The eventual result may be the pitting of China’s “denial of access” against US “assurance of access.” However, some Chinese strategists have warned their government that the South China Sea could become a trap that will divert and waste China’s economic and political capital. One possibility — though unlikely — is the US and China agreeing to “deal with one another as equals.”18 Some suggest a grand bargain “centered around a Sino-US condominium — with the (tacit) approval of other major powers such as India, Japan and Australia.”19 Such an order would “establish principles or ‘red lines’ that the US and China would agree not to cross — most notably a guarantee not to use force without the other’s permission, or [except] in clear self-defense.” The fundamental challenge for the US is to discourage China’s aggressiveness while convincing China that the US is not its enemy — a rather delicate task. One interesting twist has been to argue that the US presence provides reassurance to smaller nations so that China can continue its rise without appearing to threaten them. Others suggest that China’s increasing dependence on raw material imports will inevitably lead it to challenge the US role in Asia, resulting in security competition. US-China military relations are already poor and deteriorating. “The PLA is quite transparent about intentions, but opaque about their capabilities. The United States is the reverse … transparent about capabilities but ambiguous about intentions,” as one analyst put it.20 The two have been unable to agree even on an agenda for military talks. China insists that the US stop arms sales to Taiwan, cease “close-in” maritime and aerial surveillance of China, and remove restrictions on exporting American military technology to China.21 Although their May Strategic and Security Dialogue was marred by the case of rights activist Chen Guangcheng, who sought refuge in the US Embassy in Beijing and eventually was allowed to resettle in New York, the defense chiefs of the two countries subsequently met in Washington and US Secretary of Defense Leon Panetta visited China.22 It was hoped that these meetings would lead to a lowering of tension between the two powers. But this appears not to have followed. by Philip Bowring | The Wall Street Journal – The conflict between the Philippines and China over the Scarborough Shoal may seem to be a minor dispute over an uninhabitable rock and the surrounding waters. But it is hugely important for future relations in the region because it showcases China’s stubborn view that the histories of the non-Han peoples whose lands border two-thirds of the South China Sea are irrelevant. The only history that matters is that written by the Chinese and interpreted by Beijing. The Philippine case for Scarborough is mostly presented as one of geography. The feature, known in Filipino as the Panatag Shoal and in Chinese as Huangyan Island, is some 130 nautical miles off the coast of Luzon, the largest island in the Philippine archipelago. It’s well within the Philippines’ Exclusive Economic Zone, which, as per the U.N. Law of the Sea Convention, extends 200 nautical miles off the coast. On the other hand, the shoal is roughly 350 miles from the mainland of China and 300 miles from the tip of Taiwan. China avoids these inconvenient geographical facts and relies on historical half-truths that it applies to every feature it claims in the South China Sea. That’s why it’s now feuding with not just the Philippines, but other nations too. Beijing’s famous U-shaped dotted line on its maps of the South China Sea defines territorial claims within the 200-mile limits of Malaysia, Vietnam, the Philippines and Brunei, and close to Indonesia’s gas-rich Natuna Islands. In the case of the Scarborough Shoal, China’s Ministry of Foreign Affairs gives the historical justification that the feature is mentioned in a Chinese map from the 13th century—when China itself was under alien Mongol rule—resulting from the visit of a vessel from China. This “we were there first” argument is nonsense. Chinese sailors were latecomers to the South China Sea, to say nothing of onward trade to the Indian Ocean. The seafaring history of the region at least for the first millennium of the current era was dominated by the ancestors of today’s Indonesians, Malaysians, Filipinos and (less directly) Vietnamese. As China’s own records reveal, when Chinese traveled from China to Sumatra and then on to Sri Lanka, they did so in Malay ships. This was not the least surprising given that during this era, Malay people from what is now Indonesia were the first colonizers of the world’s third largest island, Madagascar, some 4,000 miles away. (The Madagascan language and 50% of its human gene pool are of Malay origin). They were crossing the Indian Ocean 1,000 years before the much-vaunted voyages of Chinese admiral Zheng He in the 15th century. Malay seafaring prowess was later overtaken by south Indians and Arabs, but they remained the premier seafarers in Southeast Asia until the Europeans dominated the region. The Malay-speaking, Hindu-ized Cham seagoing empire of central Vietnam dominated South China Sea trade until it was conquered by the Vietnamese about the time the European traders began to arrive in Asia, while trade between Champa (present-day southern Vietnam) and Luzon was well established long before the Chinese drew their 13th century map. The Scarborough Shoal, which lies not only close to the Luzon coast but on the direct route from Manila Bay to the ancient Cham ports of Hoi An and Qui Nhon, had to be known to Malay sailors. The Chinese claim to have “been there first” is then like arguing that Europeans got to Australia before its aboriginal inhabitants. Another unsteady pillar in China’s claim to the Scarborough Shoal is its reliance on the Treaty of Paris of 1898. This yielded Spanish sovereignty over the Philippine archipelago to the U.S. and drew straight lines on the map which left the shoal a few miles outside the longitudinal line defined by the treaty. China now conveniently uses this accord, which these two foreign powers arrived at without any input from the Philippine people, to argue that Manila has no claim. The irony is that the Communist Party otherwise rejects “unequal treaties” imposed by Western imperialists, such as the McMahon line dividing India and Tibet. Does this mean Vietnam can claim all the Spratly Islands, because the French claimed them all and Hanoi has arguably inherited this claim? China also asserts that because its case for ownership dates back to 1932, subsequent Philippine claims are invalid. In other words, it uses the fact that the Philippines was under foreign rule as a basis for its own claims. Manila wants to resolve the matter under the U.N. Law of the Sea Convention, but Beijing argues that its 1932 claim isn’t bound by the Convention, which came into effect in 1994 since it preceded it. That’s a handy evasion, most probably because China knows its case for ownership is weak by the Convention’s yardsticks. China is making brazen assertions that rewrite history and take no account of geography. Today’s naval arguments won’t come to an end until the region’s largest disputant stops rewriting the past. Mr. Bowring is a Hong Kong-based journalist. by Linh Nguyen, Huy Duong | SCSS – To understand the complex nature of disputes over the Paracel and Spratly Islands, a comprehensive integration of the legal and the political perspectives is required. The legal perspective allows us to determine whether arguments of the claimants are valid and whether they are actually supported by historical facts. This essay reviews and analyses the arguments of the claimants from the perspective of international law and argues for Viet Nam’s position. The Paracel Islands are disputed between Viet Nam, the People’s Republic of China (hereafter referred to as “China”), and the Republic of China (“Taiwan”), all of which claim sovereignty over the whole archipelago. The dispute over the Spratly Islands involves Viet Nam, China, Taiwan, the Philippines, Malaysia, and Brunei Darussalam (“Brunei”). While the first three claimants assert their sovereignty over the whole archipelago, the Philippines (since 1951) and Malaysia (since 1978) have claimed parts of the archipelago, and Brunei has only claimed a single feature (Louisa Reef, since 1984). According to international law, the discovery of a terra nullius itself does not sufficiently legitimize any legal status for the discovering State over that territory. To acquire sovereignty over the terra nullius, a State must effectively occupy that territory. There are two principles that govern this effective occupation. The first is the principle of actuality, which requires that the State actually possesses the terra nullius, considers it as part of the State’s territory, and exercises State authority and administration over it for a reasonable period of time. In addition to the material (corpus) element, the actual possession also requires the intentional (animus) element of whether a State wishes to possess the terra nullius. The second is the principle of publicity, which requires that the possession by a State must be announced to, or acknowledged by, other sovereign States1. An individual or a company cannot acquire sovereignty over a territory. – The States of Viet Nam knew of the Paracel and Spratly Islands, grouped them together, named them as “Đại Trường Sa” (Hán-Nôm: 大長沙; English: Grand Long Sand), “Hoàng Sa” (黃沙, Yellow Sand), or “Vạn Lý Trường Sa” (萬里長沙, Ten-Thousand-Mile Long Sand), and considered them as part of Viet Nam’s territory. – Throughout more than three hundred years, from the 16th to the 19th centuries, the States of Viet Nam had continuously exercised their sovereignty at least over the Paracel Islands by frequently sending the Flotillas of Hoàng Sa and Bắc Hải to the archipelago, which would stay there for several months every year for surveying and exploiting resources in a systematic manner. Personnel from these flotillas collected goods from wrecked ships, built temples, planted trees to symbolize the State’s sovereignty, collected taxes, and provided assistance to foreign ships in danger. These activities of the Vietnamese States were totally free from any opposition or disputes from other countries, including China, and contained both the corpus and animus elements of an actual possession. Viet Nam uses official documents from the 17th century to support these arguments. These include Đại Nam thực lục tiền biên (1600–1775) (大南實錄前編, The Early Chapter of The Chronicles of Đại Nam [Đại Nam is an ancient name of Vietnam]), Toản tập Thiên Nam tứ chí lộ đồ thư (1630–1653) (纂集天南四至路图書, The Collection of the South’s Road Map), Phủ biên tạp lục (1776) (撫邊雜錄, Miscellany on the Pacification at the Frontier), Đại Nam thực lục chính biên (1848) (大南實錄正編, The Main Chapter of The Chronicles of Đại Nam), Đại Nam nhất thống chí–the combinatorial record for geography and history of Đại Nam (1865–1882) (大南ー統誌, The Record of The Unified Đại Nam), Hoàng Việt dư địa chí (1833) (皇越輿地誌, Geography of The Viet Empire), Việt sử thông giám cương mục khảo lược (1876) (越史通鑑綱目考略, Outline of The Chronicles of The Viet History), official documents of the Nguyễn Dynasty on petitions and imperial decrees, and many maps and documents made by other countries at that time2. Jaseniew Vladimir and Stephanow Evginii, in their 1982 book entitled “The Chinese Frontiers: From Traditional Expansionism to Present Hegemonism”, listed the activities of the Vietnamese States in continuously exercising their sovereignty over the Paracel and Spratly Islands, and emphasized that “feudal States of Viet Nam had for long annexed archipelagos such as the Paracels and Spratlys into their State’s territory”3. In 1899, then Governor-General of Indochina Paul Doumer submitted a proposal to the Government of France to build a lighthouse in the Paracel Islands. Financial difficulty, however, prevented this plan from being realized. On March 8, 1925, the Governor-General of Indochina affirmed that the Paracel Islands were part of French territory4. Surveillance and research trips thus had been organized in the Paracel Islands since 1925 and in the Spratly Islands since 19275. In 1930, the French authorities in Indochina sent a mission group to set up a flag pole in the Spratly Islands. Since then until 1933, French naval units established a garrison on the main islands of the archipelago, including Spratly (Trường Sa) (April 13, 1930), Amboyna Cay (An Bang) (April 7, 1933), Itu Aba (Ba Bình) (April 10, 1933), the Two-Island Group including Southwest and Northeast Cays (Song Tử Tây, Song Tử Đông) (April 10, 1933), Loaita (Loai Ta) (April 11, 1933), and Thitu (Thị Tứ) (April 12, 1933), together with small islets/cays surrounding these islands. These occupation activities were proclaimed in the July 26, 1933 Official Gazette of the French Republic and the September 25, 1933 Official Gazette of Indochina, and did not meet any opposition from China, the Philippines, the Netherlands (which occupied Brunei at that time), or the United States of America. The United Kingdom of Great Britain and Northern Ireland required explanation for these activities and was satisfied with the response from France6. On December 2, 1933, Governor of Cochinchina (Nam Kỳ) J. Krautheimer incorporated the Spratly Islands into the Province of Bà Rịa. On March 30, 1938, Emperor Bảo Đại issued his imperial edict to incorporate the Paracel Islands into the Province of Thừa Thiên. On June 15, 1938, the Governor-General of Indochina Jules Brévié issued a decree on establishing an administrative unit in the Paracel Islands. The French authorities then effectively occupied the whole archipelago with a permanent guard unit. In 1938, a sovereignty stele was erected with the inscription of the words “The French Republic – The Kingdom of An Nam – The Paracel Islands, 1816 – Pattle Island – 1938”. A lighthouse, a meteorological station, and a radio station were also set up on Pattle Island5. Japan occupied the Spratly Islands in 1939, re-named the archipelago as Shinnan Shoto (新南諸島, the New Southern Islands), and put it under the jurisdiction of Kaohsiung (Taiwan, which China had ceded to Japan in the Treaty of Shimonoseki in 1895). France subsequently sent a diplomatic note to oppose Japan’s military action and re-affirmed that the Spratly Islands were part of An Nam’s territory7. There was no protest by China against either Japan’s occupation of the Spratlys or France’s assertion of sovereignty. Immediately after Japan surrendered in 1945, the French authorities restored their presence in the Paracel and Spratly Islands. In June 1946, a subunit of the French armed forces landed to re-occupy the Paracel Islands. In October 1946, the French battleship Chevreud arrived in the Spratly Islands and installed a sovereignty stele on Itu Aba Island8. When the Republic of China sent its troops to occupy Itu Aba Island in late 1946, France also opposed the action and demanded China’s withdrawal from the archipelago. In summary, as the protecting power representing Viet Nam’s interests, France maintained Viet Nam’s sovereignty over the Paracel Islands without any interruption. In the Spratly Islands, France considered the archipelago as aterra nullius and conducted its effective occupation with the knowledge of other States without any opposition from China, the Philippines, the Netherlands (which occupied Brunei at that time), the United States of America or the United Kingdom of Great Britain and Northern Ireland. With the Hạ Long Bay Treaty of 1949, France transferred the sovereignty of Cochinchina, which included the Spratlys, to Viet Nam. On October 14, 1950 the government of France officially handed over the control of the Paracels to Viet Nam’s Bảo Đại Administration. On September 7, 1951, during the seventh session of the San Francisco Conference on the Treaty of Peace with Japan, Prime Minister and Foreign Minister Trần Văn Hữu of the State of Viet Nam officially affirmed Viet Nam’s sovereignty over the Paracel and Spratly Islands. His statement did not meet with any objection or reservation of opinion from any of the 51 States attending the Conference. The Soviet Union requested an amendment that envisaged the recognition by Japan of the sovereignty of the People’s Republic of China over a series of territories including the Paracels and the Spratlys. This amendment was rejected by 46 of the countries present, only Poland and Czechoslovakia supported the Soviet request. Neither China nor Taiwan attended the Conference7. After the partition of Viet Nam by the 1954 Geneva Accords, the administration of the Paracel and Spratly Islands was placed under the Republic of Viet Nam (RVN, South Viet Nam). Immediately after the last French troops’ withdrawal on August 22, 1956, the Republic of Viet Nam promptly established its control over the Paracel and Spratly Islands, and faced challenges from China, which disputed the archipelagos9. The RVN, as a successor to the French authorities for legal titles, rights, and demands in the Paracel and Spratly Islands, had continuously exercised its administration, surveillance, exploitation, and defence over the two archipelagos through a series of actions such as erecting flag pole and sovereignty stele in the Spratly Islands (August 1956), incorporating the Paracel Islands into the Province of Quảng Nam (July 1961), affirming sovereignty over the two archipelagos by a statement of the Ministry of Foreign Affairs (July 15, 1971), incorporating the Spratly Islands to the Province of Phước Tuy (September 1973), granting license for guano collection, and detaining China’s troops who were disguised as fishermen in an attempt to occupy the western group of the Paracel Islands (February 1959). China’s complete occupation of the Paracel Islands by military forces in January 1974 was strongly opposed by RVN, which took every opportunity to affirm its sovereignty, including sending letter to demand an intervention from the President of the United Nations General Assembly and the Secretary-General of the United Nations, issuing statements to re-affirm sovereignty at the meeting in March 1974 of the Economic Commission for the Far East (precursor of the Economic and Social Commission for Asia and the Pacific) and the Third United Nations Conference on the Law of the Sea (July 1974), and proclaiming the White Paper on the Paracel and Spratly Islands (February 1975). As part of its exercise of sovereignty, in December 1982 Viet Nam established Hoàng Sa District (huyện) under the Province of Quảng Nam–Đà Nẵng for the Paracel Islands, and Trường Sa District under the Province of Đồng Nai for the Spratly Islands. Hoàng Sa and Trường Sa Districts are currently under the jurisdiction of the City of Đà Nẵng and the Province of Khánh Hoà, respectively. Viet Nam has also maintained permanent troops in the Spratly Islands. In addition, Vietnamese top officials have paid several visits and joined surveillance trips to affirm Viet Nam’s sovereignty in the Spratly Islands. These include a series of visits in May 1988 by Minister of Defence Lê Đức Anh, Vice-Chairman of the State Council Nguyễn Quyết, and Chief of the Armed Forces’ General Staff Đoàn Khuê. More recent visits of top officials include those by Member of the Politburo of the Communist Party of Viet Nam (CPVN) Phạm Thế Duyệt (April 1998), and former Secretary-General of CPVN Lê Khả Phiêu (November 2011). As China and Taiwan share the same arguments about the Paracel and Spratly Islands, they can be presented together as follows. China asserted that it was the first country to find the archipelagos, and this discovery was made as early as the reign of Emperor Wǔof the Hàn Dynasty (2nd century BCE)10. This argument, however, is not backed up by official historical documents. On this issue, Nguyễn Hồng Thao commented that “most of these documents are travel accounts, monographs, and navigation books demonstrating knowledge of ancient people about territories belonging to not only China but also other countries”9. Moreover, in these documents, the territories which China now claims to be the Paracels and Spratlys are named inconsistently, thus there are no convincing arguments that those territories are really the Paracels and Spratlys5. Moreover, the aforementioned assertion from China contradicts the encyclopedia Gǔjīn TúshūJichéng(古今圖書集成, Complete Atlas on the Past and Present) completed by the Qing Dynasty in 1706. None of the maps inZhífāng Diăn(職方典, Dictionary of Administrative Units) of this encyclopedia, including Zhífāng Zŏngbùtú(職方總部圖, General Map of the Administrative Units, Number 1), Guăngdōng Jiāngyùtú (廣東疆域圖, Territorial Map of Guăngdōng, Number 157), and Qióngzhōufǔ Jiāngyùtú(琼州府疆域圖, Territorial Map of Qiongzhou Prefecture, Numer 167), indicate any archipelagos farther to the south than Hainan Island. The islands depicted inGuăngdōng Tōngzhì (廣東通志, Annals of Guăngdōng), made during the reign of Emperor Jiājìng of the Ming Dynasty (1522–1567), also do not go beyond Qiongzhou (i.e. Hainan)11. The finding of ancient money and goods dated back to the Wáng Măng (王莽) Era (9–23 CE) is also used as archaeological evidence by China to support the early presence of its fishermen in the archipelagos. However, even if these pieces of evidence are valid, Chinese fishermen’s early presence was merely private/individual activities and thus cannot constitute an effective occupation by a State as required by international law. – The Sòng Dynasty (960–1127) sent its military patrols to the Paracel Islands’ area. This assertion is based on Wǔjīng Zŏngyào (武经总要, Military General Records) with a prologue written by Emperor Rénzōng5. However, according to Monique Chemillier-Gendreau, this record merely indicates that there were geographical surveillance trips conducted by the Chinese that went as far as the Indian Ocean, and that China knew of the Paracel Islands. The document, however, does not demonstrate any possession. – In the 13th century, emperors of the Yuán Dynasty ordered the astronomer GuōShŏujìng (郭守敬) to conduct astronomical observations in many areas, including the Paracel Islands. However, Guō’s observations, performed both inside and outside of China, were only astronomical research activities and thus could not legitimize any sovereignty status over the territories from which the observations were made. – Wu Sheng (吳升), Guangdong navy’s rear-admiral, commanded a patrol to the Paracel Islands in 1710–1712. However, according to Monique Chemiller-Gendreau, this was in fact a patrol around Hainan Island and did not go as far as the Paracels. – The local government of Guangdong opposed a German ship conducting research in the Spratly Islands in 1883. This opposition, however, was only a diplomatic action and did not have any legal status as China’s sovereignty had not been established9. Therefore, historical evidence used by China to support its claim is insufficient and weak according to international law. These pieces of evidence do not demonstrate any occupation, effective administration, or sovereignty12. As far as the effective occupation of the Paracel and Spratly Islands as terra nullius without protests from other States are concerned, Viet Nam’s arguments are stronger than those of China13. In 1921, the self-proclaimed Guăngzhou Military Government annexed the administration of the Paracel Islands to Yái (崖) District. This action did not meet any response as the Guăngzhou Military Government was not recognized by any countries in the world. In 1937, Japan occupied the islands offshore of Indochina despite the opposition from the French authorities, renamed them to “Shinnan Shoto”, and put them under the jurisdiction of Kaohsiung (Taiwan), which China had ceded to Japan in the Treaty of Shimonoseki of 1895. Japan maintained its occupation in the South China Sea’s archipelagos throughout World War II. In summary, with a limited effort in early 20th century to demonstrate its sovereignty in the Paracel Islands, China neither actually and continuously occupied nor effectively established administration over the archipelago. At the same time, China had absolutely neither influence nor interest in the Spratly Islands and did not protest when Japan claimed and occupied them. In contrast, France was the only country to protest against Japan’s occupation of the Spratlys. An irrefutable evidence of China not considering the Spratlys to be its territorry was China’s diplomatic note to France in September 1932 claiming that the Paracels “form the southernmost part of Chinese territory”5. After Japan’s surrender in 1945, it withdrew troops from mainland and all archipelagos of Indochina. France promptly restored its presence in the Paracel Islands in June 1946. In July 1947, the Republic of China sent its troops to Woody Island in the Paracels. In response, France opposed this illegal occupation and sent a military unit to the Paracel Islands to set up a garrison and built a meteorological station which would be in operation for the next 26 years until the People’s Republic of China used military force to occupy the archipelago in 1974. At the end of 1946, the Republic of China sent its troops to occupy Itu Aba Island in the Spratlys after France had erected a sovereignty stele. The Chinese Civil War’s conclusion and the proclamation of the People’s Republic of China in October 1949 forced the Republic of China’s troops to leave Woody Island in the Paracels and Itu Aba Island in the Spratlys while the French garrisons were maintained. In April 1956, French forces were withdrawn from Indochina. In the Paracels they were replaced by the Republic of Viet Nam’s troops (i.e.,South Viet Nam’s troops). At the same time, the People’s Republic of China’s troops secretly landed and occupied Amphitrite Group in the eastern part of the Paracel Islands5. On September 4, 1958, China issued a statement on its twelve-nautical-mile territorial waters, including around both the Paracel and Spratly Islands. On January 19, 1974, China used its military forces to occupy completely the Paracel Islands. Until then, the Spratly Islands “were completely out of China’s influence, let alone China’s intention to control them”7. In February 1988, China sent troops to some islands in the Spratlys, and a month later, seized six islands from Viet Nam5. All of these events make China a unique claimant in the Spratly Islands for its exclusive claim over the whole archipelago and its absolute lack of control in reality until 19887. China then established its 33rd province including Hainan Island, the Paracels, and the Spratlys in April 1988, occupied one more small island in the Spratly Islands in May 19895, and seized Mischief Reef of the Philippines in February 1995. China’s main approach to seize control over the islands is to use military force, an approach which has been condemned by international law since early 20th century. The Declaration on Principles of International Law Concerning Friendly Relations and Co-operation among States in Accordance with the Charter of the United Nations, adopted on October 24, 1970, also states explicitly that “The territory of a State shall not be the object of military occupation resulting from the use of force in contravention of the provisions of the Charter. The territory of a State shall not be the object of acquisition by another State resulting from the threat or use of force. No territorial acquisition resulting from the threat or use of force shall be recognized as legal”. The use of military force is therefore against international law and cannot legitimize any legal status for China in the Paracel and Spratly Islands. – A verbal expression by Deputy Foreign Minister Ung Văn Khiêm on June 15, 1956 to a standing member of the Embassy of China in Ha Noi that these archipelagos are part of China’s territory in terms of history. However, China fails to provide the meeting’s minutes that contains this expression by Deputy Foreign Minister Khiêm14. It should also be noted that, according to international law, deputy foreign ministers do not by default have the authority to represent a State in such matters. – A diplomatic note by Prime Minister Phạm Văn Đồng on September 14, 1958 in which China’s claim of twelve-nautical-mile territorial sea was said to be approved without any reservation of opinion regarding the Paracel and Spratly Islands. – On May 9, 1965, in response to the the escalation of the Viet Nam War and the establishment of tactical zones in the South China Sea by the United States, the Democratic Republic of Viet Nam’s newspaper Nhân Dân (The People) stated that the Paracel Islands were under the sovereignty of China. It should be noted that, according to international law, newspapers are not considered representatives of a State. Whether these statements have legal implications for the Socialist Republic of Viet Nam’s sovereignty over the Paracel and Spratly Islands will require further studies in international law. However, the author would like to offer a perspective on these statements as below. During the Viet Nam War (1954–1975), there were two States co-existing in Viet Nam, namely, the Democratic Republic of Viet Nam (DRVN) in the North, and the Republic of Viet Nam (RVN) in the South. The co-existence of these two States is agreed upon by many leading international laywers, such as James Crawford, Robert Jennings, Nguyễn Quốc Định, Jules Basdevant, Paul Reuter, Louis Henkin, and Grigory Tunkin14. Acccording to the DRVN and RVN’s understanding of the 1954 Geneva Accords, and to thede factoadministration, the RVN was the successor State to the Vietnamese titles over the Paracel and Spratly Islands. As mentioned above, the RVN had continuously controlled, exercised administration, and affirmed sovereignty until China’s occupation of the Paracel Islands by force in 1974, and until the Provisional Revolutionary Government of the Republic of South Viet Nam’s takeover of the Spratly Islands in 1975. The DRVN was a third party in the dispute between the RVN and China over the Paracels, and in that between the RVN, the Philippines and China over the Spratlys. First, given that it was the RVN, and not the DRVN, which was the successor State to the Vietnamese titles over the Paracel and Spratly Islands, the DRVN did not have the duty to defend these titles. Therefore, its conduct cannot be interpreted as acquiescence to China or the Philippines’ claims. Furthermore, as a third party, the DRVN was not in dispute or negotiation with any other State over these archipelagos. Therefore, no statement made by the DRVN can be said to have been made in the context of a dispute or negotiation over these archipelagos between it and China or the Philippines. Second, the 1958 diplomatic note of the DRVN’s Prime Minister Phạm Văn Đồng and other DRVN’s statements on the issue did not affect RVN’s titles over the archipelagos. Any legal obligation that might arise from the DRVN’s statements could only apply to the DRVN, not to the RVN. whether there has been detrimental reliance for the other party, i.e., damage or loss caused by that party’s reliance on the unilateral statement. In addition, judgements by the International Court of Justice require that the unilateral statements are made continuously over a prolonged period of time for it to give rise to binding obligations15. It is not difficult to see that the DRVN’s statements on the issue lack most of these prerequisite conditions, and therefore did not give rise to any binding obligations for the DRVN. Regarding the criterion of context, these statements were not made in the context of the DRVN and China contesting the Paracels and Spratlys with each other. Regarding the criterion of explicitness, the only authoritative statement from the DRVN – the diplomatic note by Prime Minister Phạm Văn Đồng, did not say anything explicit about the Paracels or Spratlys. Regarding the criterion of detrimental reliance, China has not taken any actions that could be said to be detrimental reliance on the DRVN’s statements. As the successor State to the DRVN and the RVN (and subsequently the Provisional Revolutionary Government of the Republic of South Viet Nam) since 1976, the Socialist Republic of Viet Nam (SRVN) succeeded to both the sovereignty of the Paracel and Spratly Islands from the RVN and the unilateral, non-binding statements from the DRVN. Since the latter is non-binding, the SRVN is free to choose to uphold the former. The re-unified Vietnamese State, therefore, has full legal basis to assert its sovereignty over the Paracel and Spratly Islands. The Philippines claims over about 60 islands, reefs, and submerged banks in the Spratly Islands16. The first assertion was made in 1947 by Tomás Cloma, a Philippine citizen, when he claimed to have discovered a group of islands and reefs 300 nautical miles to the west of Palawan Island. On May 17, 1951, the President of the Philippines claimed that islands in the Spratlys should belong to the closest territory, which is the Philippines9. This claim was opposed by the other countries. It was not until March 1956 that Tomás Cloma resumed his “work to discover” these islands. He sent a group of 40 sailors to land on many islands in the Spratlys to mark their possession. The flag of the Philippines was raised on some islands including Itu Aba17. On May 11, 1956, they proclaimed Kalayaan (Freedom-land) as the new official name of the islands and Tomás Cloma as the President of the Supreme Council of the State of Kalayaan7. This proclamation was opposed by all relevant countries10. Tomás Cloma sent a letter dated May 15, 1956 to the Republic of the Philippines’ Minister of Foreign Affairs to announce that he and his group had occupied a 64,976-square-mile area to the west of Palawan Island, that this area was outside of Philippine territorial waters and was not subject to the jurisdiction of any countries, and that this area had been found and effectively occupied as a terra nullius. He also included with the letter a map of his claimed area. Although the names of these islands were completely changed, Cloma’s map indicates that the Kalayaan area includes most of islands in the Spratlys8. The Philippines’ Minister of Foreign Affairs subsequently declared in a press conference on May 19, 1956 that the islands in the Spratlys including Itu Aba and Spratly are subject to the Philippines’ sovereignty as they are closest to the Philippines. This declaration met with objections from Sai Gon, Beijing, and Taiwan. When Taiwan showed its intention of deploying troops to the Spratly Islands, Manila promptly sent a notice to Taiwan and South Viet Nam and said that it had not officially claimed sovereignty over the area. On July 6, 1956, Tomás Cloma sent a letter to the Philippines’ government to ask that Kalayaan become a protectorate of the Philippines. In his response, the Philippines’ Minister of Foreign Affairs stated that any island in the area that is not within the group of seven islands referred to as “the Spratly Islands” by international community can be considered as terra nullius, and thus can be freely exploited and inhabited by citizens of the Philippines or any other countries. To retaliate against Tomás Comas’ activities, South Viet Nam sent a patrol ship to the Spratly Islands in August 1956. The first clash between Taiwan’s navy and Tomás Cloma’s group occurred on October 1, 1956 in North Danger Shoal. Tomás Cloma’s group ended up having all their weapons stripped while the Philippines’ government did not intervene. During 1970–1971, President Ferdinand Marcos ordered the Philippines’ navy to occupy some islands in the Spratlys including Thitu, Nanshan, and South Rock. The Philippines also organized patrols in many small islands and reefs in the northeast of the archipelago7. After the Philippines attempted once more but failed to occupy Itu Aba Island in 1971, it continued to object to Taiwan’s occupation of the island with three arguments, namely, (1) the Philippines’ sovereignty over the islands based on Tomás Cloma’s discovery of terra nullius, (2) de factooccupation without notice by China of many islands under the jurisdiction of the Allies, and (3) the Philippines archipelagic waters containing the Spratlys10. The Philippines also expanded its occupation to 1,000 troops and built an airport on Thitu Island. Tomás Cloma transferred the “sovereignty” of the islands to the Philippines’ government in 1974. By that time, the Philippines had acquired control over four islands in the Spratlys. In 1978, the Philippines deployed troops to seven islands in the Spratlys. The President of the Philippines then signed Decree 159612 on June 11, 1978 to annex these seven islands to the Philippines’ territory. The decree also states that “these areas do not legally belong to any state or nation but, by reason of history, indispensable need, and effective occupation and control established in accordance with the international law, such areas must now deemed to belong and subject to the sovereignty of the Philippines”, and that a 200-nautical-mile economic exclusive zone was set for these islands10. In a press conference on September 14, 1979, the President of the Philippines stated clearly that his country would maintain its claim over the seven islands that it occupied but not all of the Spratly Islands. The Philippines’ President also re-affirmed that these seven islands had never been occupied, known of, inhabited, or even marked in any maps before World War II, and they had thus been terra nullius until the Philippine’s occupation. On March 10, 2009, the President of the Philippines promulgated Republic Act 9522 to define the archipelagic baseline of the Philippines, in which most of the Spratly Islands was included in the Philippines’ regime of islands. 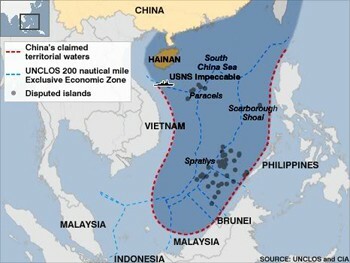 China quickly objected while Vietnam re-asserted its claims to the Spratlys but did not mention the Act specifically. Arguments from the Philippines, in general, do not have a solid basis. The Philippines maintains that the islands it claimed were terra nullius. Even if we ignore those events in the Spratlys in previous centuries, the Spratly Islands were effectively occupied since 1930 by France (French troops had been on Thitu Island since April 1933) and transferred to Viet Nam without objection from any countries including the Philippines when France left Indochina. Also, the claim that these islands should belong to the Philippines on the basis of proximity is not supported by international law. Moreover, the Philippines’ occupation and claim to the Spratly Islands have been opposed by relevant countries from the beginning. Therefore, the involvement of the Philippines in these islands cannot constitute an effective occupation without disputes as required by international law. In 1978, Malaysia made its first claims for sovereignty over Amboyna Cay, Mariveles Reef, and Commodore Reef on the basis that these features lie on its continental shelf. The 1979 map of Malaysia depicted some islands in the Spratlys as Malaysia’s territory. Malaysia started its first military occupation in June 1983 by taking control of Swallow Reef, which is within its claimed area. In September 1983, Malaysia officially declared its intention to occupy James Shoal, Swallow Reef, Ardasier Reef, and Mariveles Reef, and asserted that these islands/reefs lie within Malaysia’s “marine economic zone”7. In December 1986, Malaysia’s troops occupied Mariveles and Ardasier Reefs. In June 1999, Malaysia expanded its occupation to a total of seven islands/reefs/shoals by taking control over Erica Reef and Investigator Shoal. In general, Malaysia cites the international law’s regulations of continental shelf to support its claim in the Spratly Islands. However, Article 76 of the 1982 United Nations Convention on the Law of the Sea (UNCLOS) defines clearly that: “The continental shelf of a coastal State comprises of the seabed and subsoil of the submarine areas that extend beyond its territorial sea throughout the natural prolongation of its land territory to the outer edge of the continental margin, or to a distance of 200 nautical miles from the baselines from which the breadth of the territorial sea is measured where the outer edge of the continental shelf does not extend up to that distance”. This definition does not govern the above water islands/reefs/cays on the continental shelf and thus cannot provide legal ground for Malaysia’s claims to any feature that is above high tide. The legal question for a feature that Malaysia claims is whether it is above high tide or not. This question is critical because a State can only claim and acquire sovereignty over islands that are naturally above high tide. If a feature is submerged or is a low-tide elevation then neither Malaysia nor any other State can claim sovereignty over it18,19, and Malaysia can only claim certain restricted rights as prescribed by UNCLOS. And if this is the case, we shall have to resolve the question of whether that feature lies within Malaysia’s exclusive economic zone or that of another State. Brunei only claims Louisa Reef based on the argument that this reef is within its exclusive economic zone. Article 56 of the 1982 UNCLOS, however, only acknowledges that a coastal State has (1) “sovereign rights for the purpose of exploring and exploiting, conserving and managing the natural resources, whether living or non-living, of the waters superjacent to the seabed and of the seabed and its subsoil, and with regard to other activities for the economic exploitation and exploration of the zone, such as the production of energy from the water, currents, and winds”, and (2) jurisdiction to establish and use artificial islands, installations and structures for marine scientific research, and protection and preservation of marine environment. The use of UNCLOS to claim sovereignty over islands within the exclusive economic zone is an aberrant interpretation of the Convention. Therefore, the argument from Brunei, similar to that of Malaysia, is unconvincing if applied to islands that are naturally above high tide. The legal question in this case is whether Louisa Reef is an island naturally above high tide, or is it submerged or is a low-tide elevation. If Louisa Reef is submerged or is a low tide elevation then neither Brunei nor any other countries can claim sovereignty over it18,19, and Brunei can only claim certain restricted rights as prescribed by UNCLOS. And if this is the case, we shall have to resolve the question of whether Louisa Reef lies within Brunei’s exclusive economic zone or that of Viet Nam or Malaysia. In the light of international law, the above comparative analysis of perspectives from different claimants of the Paracel and Spratly Islands reveals that the most logical and best-supported arguments are those of Viet Nam. In reality, however, the prolonged and complicated nature of disputes in area, as well as the involved parties’ intention, make dispute resolution through legal means a very difficult approach. Instead, an integration of legal, historical, political, and economic solutions is needed to resolve the issue. And any resolution for the South China Sea’s dispute would require efforts and good will of the involved parties, particularly China, which has been objecting to any proposal made by Viet Nam to bring the Paracel and Spratly Islands’ issue to the International Court of Justice. Nevertheless, the legal perspective of the issue is still of vital importance. The authors wish to thank Nguyễn Đức Hùng and Lê Vĩnh Trương for their comments and discussion. 1. Wójciech Góralczyk, Stefan Sawicki (2007). Introduction to International Public Law (Prawo miedzynarodowe publiczne w zarysie). Warszawa, Wydawnictwo Prawnicze LexisNexis (in Polish). 2. Ministry of Foreign Affairs of the Socialist Republic of Viet Nam (1988).White Paper: The Archipelagos of Paracels, Spratlys and International Law (in Vietnamese and English). 3. Vladimir Jaseniew, Evginii Stephanow (1982). The Chinese Frontiers: From Traditional Expansionism to Present Hegemonism (Kитайские границы: от традиционного экспансионизмa к текущемy гегемонизмy). Moscow (in Russian). 4. Jean-Pierre Ferrier (1975). The Conflict of the Paracel Islands and the Problem of Sovereignty over the Uninhabited Islands (Le conflit des iles Paracels et le problème de la souveraineté sur les iles inhabitées). Annuaire francais de droit international. Vol. 21 (in French). 5. Monique Chemillier-Gendreau (1998). Sovereignty over the Archipelagos of Paracels and Spartlys(Chủ quyền trên hai quần đảo Hoàng Sa và Trường Sa) (in Vietnamese). Ha Noi. Translated from “La souveraineté sur les archipels Paracels et Spratleys” (in French). L’Harmattan, Paris. 6. Marcel Beauvois (November 27, 1971). 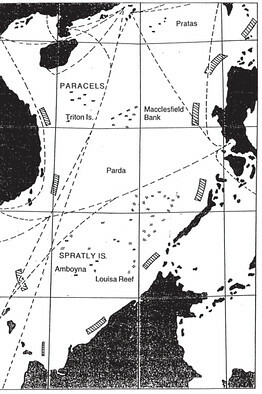 The Archipelagos of Paracels and Spratlys (Les archipels Paracels et Spratley). Vietnam Press nr.7574 (in French). 7. Jan Rowiński (1990). South China Sea––Potential Dispute in Asia (Morze Południowochińskie––region potencjalnego konfliktu w Azji). Warsaw (in Polish). 9. Nguyễn Hồng Thao (2000). Viet Nam and the Maritime Disputes in the South China Sea”. Institute of Economic Law of the Sea (Le Vietnam et ses différends maritimes dans la mer de Bien Dong [Mer de Chine méridionale]). Monaco (in French). 10. Lee G. Cordner (1994). The Spratly Island dispute and the Law of the Sea. Ocean Development and International Law, Washington D.C. Vol. 25. 11. Phạm Hoàng Quân (December 11, 2007). “Xisha” and “Nansha” in China’s historical documents. Talawas: http://www.talawas.org/talaDB/showFile.php?res=11697&rb=0302(in Vietnamese). 12. Kuang-Minh Sun (1990/1991). Dawn in the South China Sea? A Relocation of the Spratly Islands in an Everlasting Legal Storm. South African Yearbook of International Law, University of South Africa. Vol. 16. 13. Lacoste Yves (1981). China’s Sea or Southeast Asian Sea (Mer de Chine ou Mer de l’Asie du Sud-Est). Herodote, Paris (in French). 15. Từ Đặng Minh Thu (July 2007). Sovereignty over the Two Archipelagos of Paracels and Spratlys(Chủ quyền trên hai quần đảo Hoàng są và Trường Sa).Thời Đại Mới (New Era) Magazine, Vol. 11 (in Vietnamese). 16. Michael Hindley, James Bridge (June 1994). South China Sea: the Spratly and Paracel Islands Dispute. The World Today, London, Vol. 50.